Over the last several months, we have talked to a lot of people who feel like there is no ground beneath their feet, who stare in awe at the sheer devastation of daily headlines, and who bear painful witness to the racism, sexism and xenophobia inherent in Trump's quick actions in his first days in office. Many people we talk to feel confused, anxious, and helpless. At the same time, they also feel the seed of a Warrior deep within. We feel this, too. Collectively, we are breathing life into her being so that she may come to life, stand up, rise up, burn brightly, and resist mightily. That feeling inside ourselves represents a deep knowing that now, more than ever, our highest selves are needed – both to engage peacefully where we currently stand, and also to grow beyond the polarization that now limits and disconnects us. Our Shadowboxing retreat is born out of this need within ourselves and our community. Shadowboxing is a women's retreat focused on seeing and healing the darkness and divisions within ourselves and our communities. At this retreat, we will start to become intimate with our shadows, with the darkness that can both be so hidden within ourselves yet broadcast so loudly on the political stage. Where and how do we find the shadow? What feeds it? How do we meet it, work with it, accept it, embrace it? How do we learn to use our own shadow elements to not only understand ourselves but those in our community who do not feel, think or act like us? This moment in history – fraught with political, cultural and religious divides – provides an incomparable opportunity for this critical work. In fact, it is necessary if we are going to move beyond our egocentric mindset into a more evolved society and culture. The retreat will include yoga, journaling, meditation, ritual, and sharing within the sacred circle we co-create, to engage in deep shadow work. From the darkness, we will seek to understand ourselves and, in doing so, The Other so that we may bring more love, more understanding, and more compassion to our fractured world. Our work will take place at Professor Valley Field Camp, an idyllic desert setting on the banks of Professor Creek, just 20 minutes from Moab, Utah. Redrock towers and cliffs surround the site, the Colorado River flows just minutes down the road, silence reigns supreme, and starry skies shine unimpeded by city lights. 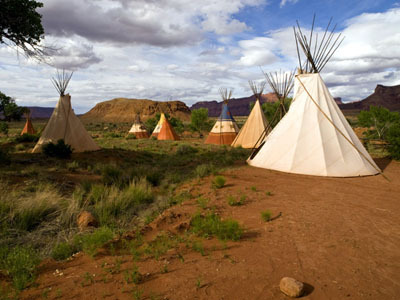 We will sleep in Lakota-style tipis and dive into the depths of Self and Other under the protective canopies of cottonwood trees. Vinyasa and yin yoga practices will be a part of our daily routine, allowing us to root into our bodies and more deeply process all that arises in our work together. The workshop will be $250 per person, not including travel to and from Professor Valley. Please contact us here to sign up today!